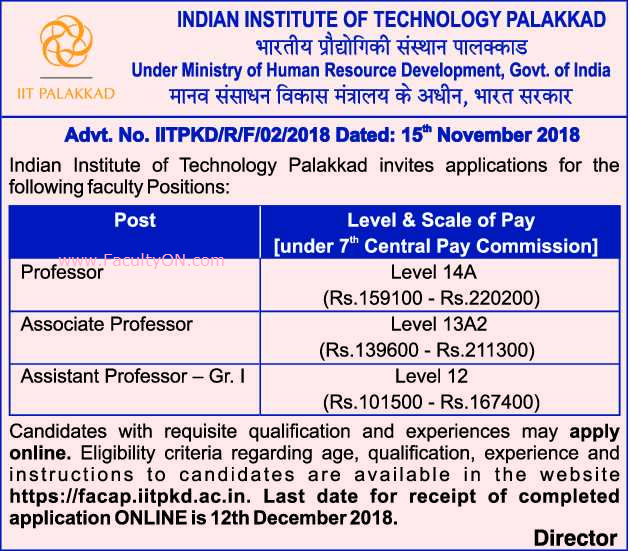 Indian Institute of Technology Palakkad has advertised newspaper for the recruitment of Teaching Faculty- Professor / Associate Professor / Assistant Professor jobs vacancies. Interested and eligible job aspirants are requested to apply on or before 12th December 2018. Check out further more details below. About College: IIT Palakkad, one of the new IITs established under MHRD during the year 2015, started academic activities from August 2015. Currently it is functioning from the temporary campus located at Ahalia integrated campus, Kozhipara, Palakkad. At least 10 years industrial / research/teaching experience of which at least 4 years should be at the level of Associate Professor in IITs, IISc Bangalore, IIMs, NITs and IISERs or at an equivalent level in any such other Indian or foreign institution/institutions of comparable standards. At least 6 years industrial / research/teaching experience of which at least three years should be at the level of Assistant Professor / Senior Scientific Officer / Senior Design Engineer. At least 3 years industrial / research/teaching experience excluding, however, the experience gained while pursuing Ph.D. Candidates not eligible for direct recruitment as Assistant Professor Grade I, such as those with lesser experience may be considered for the regular position of Assistant Professor Grade II. Age Limit: For the post of Assistant Professor, the candidates should be below 40 years of age and preferably below 35 years. For the post of Associate Professor, the candidates should be below 45 years of age and preferably below 40 years. For the post of Professor , the candidates should be below 50 years of age and preferably below 45 years. In all cases age will be reckoned as on the date of this advertisement.